Yesterday, myself and a few colleagues attended the Leica Geosystems UK HDS Symposium, held a Luton Hoo Hotel near Luton. The annual event is organised to showcase ground-breaking improvements to Leica’s HDS Scanning & Imagery portfolio of hardware and software, as well as serving as a platform for their user-base to meet and discuss the subject. This year’s event centred around the new game-changing solution from Leica Geosystems and Autodesk; the Leica BLK360 and Recap 360 Pro App, only announced earlier this month at Autodesk University in Las Vegas. Although all attendees were clearly at the event for a multitude of reasons, it was obvious what the main article of the day was, the BLK360 which presents a “new, simple way to capture reality”. The new scanner (which is only marginally bigger than an iPhone 7 Plus) has a 60 meter range and can capture 360,000 points per second. 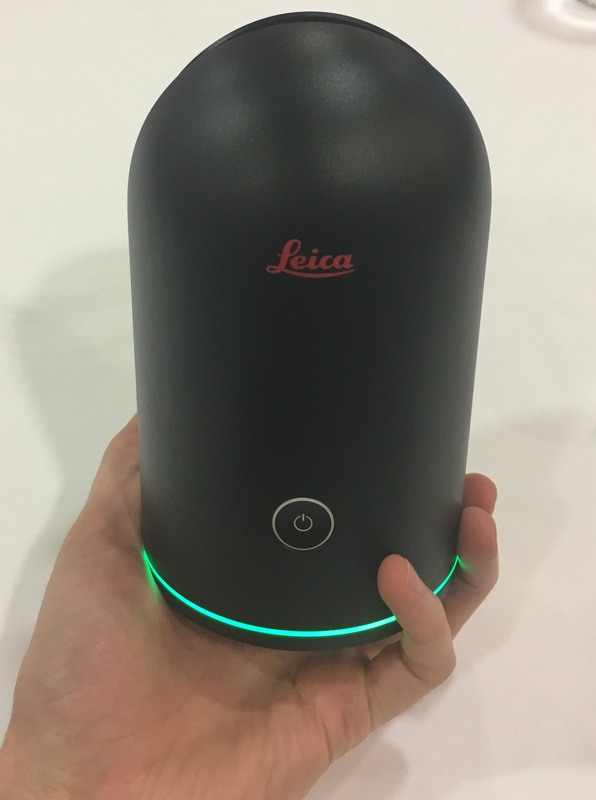 This is Leica’s first true imaging scanner – a 360° panoramic imaging device with a 15.1 megapixel camera, full HDR LED Flash support with the added bonus of a thermal imaging camera. Even more impressive, the scanner takes around 3 minutes to complete a full 360° scan including imagery! I’m someone who’s relatively new to 3D laser scanning and I could certainly know a lot more about the subject than what I do currently, but it was obvious that this scanner was something worth getting excited about – it certainly grabbed our interest. When Leica’s EMEA Business Manager, Paul Burrows, revealed the scanner, it was warmly received with an applause from an audience eager to know more. The smallest scanner of its kind, we can see it revolutionising both indoor and outdoor scanning. The completely wireless scanner is controlled via Autodesk’s Recap 360 mobile app on iPad Pro which is designed to enhance the simplicity of scanning, registering scans from the scanner and storing them on your iPad in almost real time, allows the surveyor to interact with the data as it’s been captured. From where we stand as a company, the scanner presents exciting potential for a new, simplified scanning workflow for the right type of project. We see it as a complimentary scanning tool which will slide easily into our existing hardware and software solutions portfolio, providing us with a flexible approach to tailoring our solutions to specific project needs. It’s not a high precision survey grade tool, such as our Leica P20 series scanner, but can easily be integrated into our workflows to supplement datasets for those hard to reach places! Our MD, Andy Roberts posed the question “Can it operate when inverted?” – as he was keen to understand the usability of the unit in relation to our void scanning services as well as the viability of attaching the scanner to a UAV. The answer to his question was yes, it can be used upside down, but as it currently stands, it’s designed to be used as a static scanner, potentially limit the scans capabilities in relation to UAVs at this stage – however, watch this space! The event was well worth attending and as always, we were well looked after by the Leica UK & Ireland team. Thanks to Leica for inviting us along to the event and thanks to Luton Hoo Hotel for looking after us all for the day. With regards to the BLK360, we’ve certainly registered our interest and intend to integrate one into the way we work when it becomes available in Spring 2017!